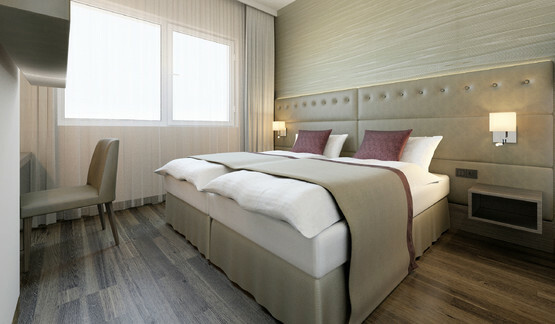 The 262 newly-decorated rooms of Wyndham Grand Salzburg Conference Centre Hotel exhibit a clear and modern design. One Executive Grand Suite, five Business Suites and three Junior Suites offer highest comfort during your stay in Salzburg. Anlongside with the suites four room categories are available: Standard, Executive Business, Club and family rooms. 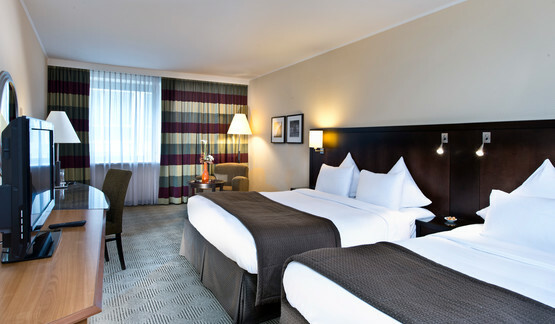 Extra-large beds with new, high-quality mattresses, air conditioning and soundproof windows ensure a good night's sleep. Free WiFi internet access in all rooms of our Salzburg hotel, minibar and safe are just as much part of our hotel's standard offering as a flat screen TV and room service. 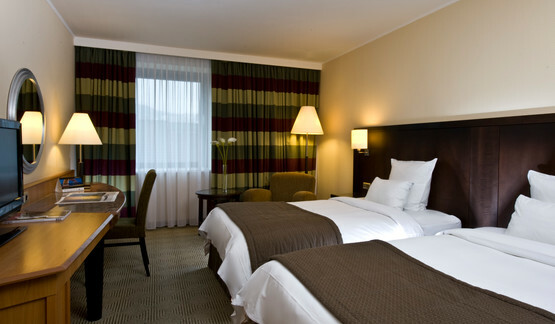 Wyndham Grand Salzburg Conference Centre Hotel also offers a room suitable for wheelchairs and disabled access to all public areas of the hotel. 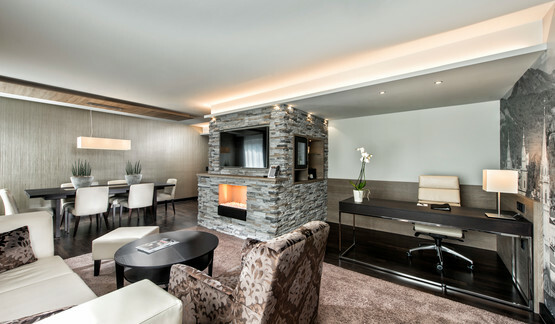 The executive floor of our Salzburg hotel is freshly modernised and opened. 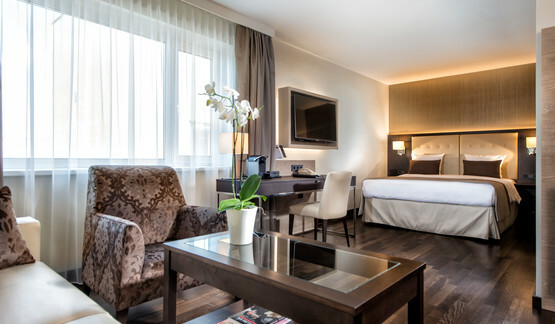 The twin rooms of the standard category at our Salzburg hotel are equipped with two separate single beds as well as an armchair and a table. One of these rooms is suitable for wheelchairs. The modern Executive Rooms are equipped with queensize beds, working desk, nespresso machine, ironing facilities, room safe, minibar, bathrobe and slippers. 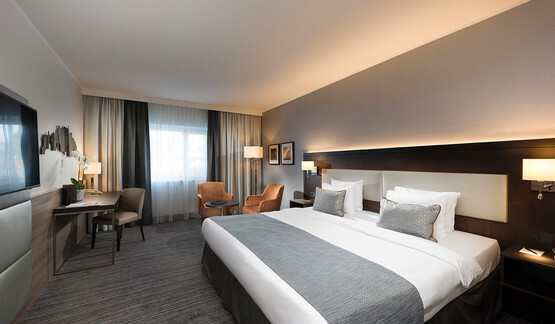 The newly renovated Comfort Rooms in the Wyndham Grand Salzburg Conference Centre are equipped with particularly comfortable Comfort Mattresses (30 cm high) as two single beds or one double bed. There is also a sitting area, desk, 49" flatscreen TV, room safe and a minibar in the room. A free bottle of mineral water is also available for guests upon arrival. Enjoy the facilities of our Club Rooms - equipped with queensize beds, a nespresso machine, ironing facilities and a room safe. The rich breakfast buffet of our Salzburg hotel, WiFi internet access, daily newspaper, a welcome surprise and access to the newly opened Club Lounge of the hotel are included. Savor delicious breakfast buffet, snacks and drinks during the entire day in our lounge free of charge. A lovely sun terrasse invites to benefit of a wonderful view over Salzburgs' landscape. 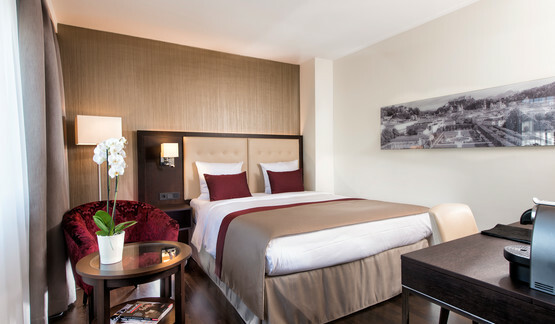 For family and friends, the spacious 34 m² family rooms at Wyndham Grand Salzburg Conference Centre Hotel are fitted with cosy queen-sized beds or with one queen-sized and one single bed. The large bathroom and a seating area with table and armchairs for quiet evenings ensure a comfortable stay. 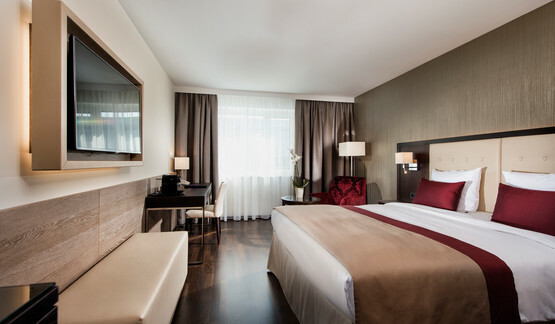 Best offer for business travelers: The Business Class Rooms offer 28 sqm. All hotel rooms of this category are equipped with a queen size bed, a comfortable sitting area as well as a small working desk, a nespresso machine, ironing facilities and a room safe. The various breakfast buffet of our hotel in Salzburg, WiFi internet access, daily newspaper, a welcome surprise and access to the newly opened Club Lounge of the hotel are included. Savor delicious breakfast buffet, snacks and drinks during the entire day in our lounge free of charge. A lovely sun terrasse invites to benefit of a wonderful view over Salzburgs' landscape. The stylish modern Junior Suites are equipped with a king or queensize bed, a comfortable couch, a working desk, Nespresso machine, ironing facilities, a room safe and a minibar. The price includes our fresh breakfast buffet and usage of WiFi internet access. 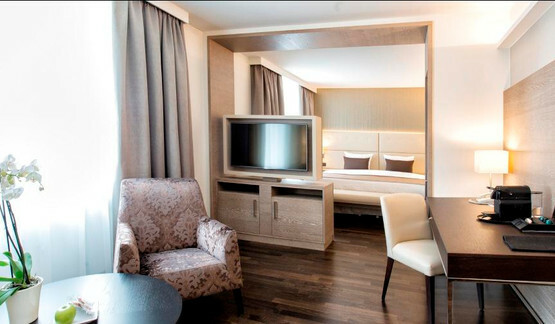 The Executive Grand Suite of our Salzburg hotel is newly renovated, newly opened at the executive floor. The stylish modern suite disposes of a spacious living area and a separated sleeping room. It is equipped with a king-size bed, a comfortable sitting area, a working desk, a meeting table for 6 persons, a nespresso machine, ironing facilities, bathrobe, slippers and a room safe. Our fresh breakfast buffet, WiFi, daily newspaper, a welcome surprise and access to the Club Lounge are included. Enjoy a small breakfast buffet as well as snacks and drinks (also alcoholic drinks) during the entire day in the Club Lounge. A lovely roof top terrace invites to benefit from a wonderful view over Salzburg and the Alps. The Business Suite was recently opened and can be booked for up to five persons. The modern, trendy rooms offer a king size bed, an extentable couch and a desk with seating possibility. The bath room is equipped with a bath tub, separate shower and a toilet. Also part of the equipment is free Wi-Fi, a flat screen tv, nespresso coffee maker, iron, safe, a minibar, bath robe and slippers.